Engagement is one of digital’s most prickly talking points. Increasingly Digital Natives expect brands to understand needs deeply and then deliver answers promptly. Thanks to technology, professional, personalized automated Marcoms programmes help ensure that such responses are not simply addressed, they exceed average expectations. We live in a society where all generations see the world through the lens of technology. Engaging with Digital Natives calls for deeper insights into their lifecycles. Fortified by such knowledge, brands can provide accessible services that are easy to act upon via unified frictionless experiences that cross all divides and devices. 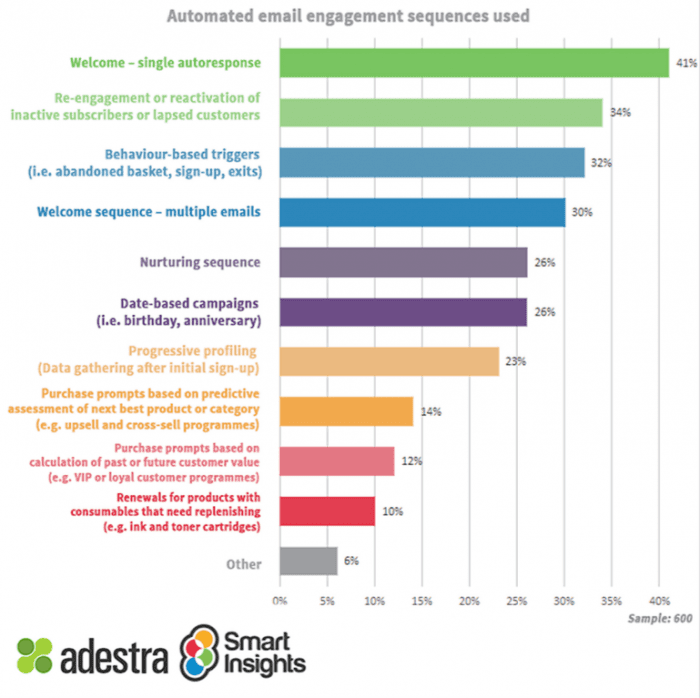 According to a recent report from Smart Insights and Adestra around 41% of marketers take advantage of a single welcome email. Inactive subscribers are contacted by 34% of marketers. Behaviour-based triggers (such as abandoned carts) trigger around 30% response. Retargeting using ads or email reminders turns out to be an especially popular approach when engaging with existing audiences. Adestra found that many marketers are either planning or already use ad network retargeting such as Google AdWords as well as retargeting where applicable through social networks. On average, nearly two-thirds of marketing respondents broadcast through email one to three times per month. Of concern, some marketers are still sending unpersonalized communications. Twenty-two percent don’t segment data. Sixty-three percent only use two to five segments. However, on the slightly more positive side, dynamic content insertion is deployed by four in ten marketers. Of course, effective customer engagement requires more than broadcasting emails alone. One common ‘fix-all’ solution to engagement is to feature FAQs. These address common questions, but when dealing with people, real-life needs and unexpected glitches tend not to stick to neatly presumed Frequently Asked Questions. To remain trusted, valued and engaged, in addition to demonstrating agility, digital leaders have to listen adapt and respond to changing requirements throughout the customer journey. For example, I recently was online with Apple’s Live Chat to get advice on choosing a new laptop. I spent a good hour going through my requirements. Three days later, I needed to refer to the notes. (The Live Chat thread was not automatically emailed to me – although I did receive a robotically generated standard assessment form about the Live Chat’s usefulness). So instead I was left to once again search the site for its Live Chat section. (Have you noticed how many brands make it so convoluted to speak to someone via a site?) Having eventually navigated the maze I was told that there were no records of the original Live Chat from three days earlier. They were happy to restart the entire Q&A process from scratch. (But honestly, by this point, any sense of enthusiasm or engagement I might have felt for the brand had drained along with my current laptop’s battery life). Effective customer engagement understands customer relationships. Given current normal communications, to a degree that requires incorporating automated processes. But to truly work, any process has to appreciate how to tackle human needs and foibles rather than just coding efficiencies. Today’s Digital Natives are born into a world where glass covered microchips act as a very fine membrane between what one has and what one could (or should) have. Naturally, Digital Natives expect more than great products, prices or services. They demand personally relevant experiences that realize goals. Addressing this requires a fundamental engagement and transitional change in how brands see themselves and what they offer consumers. Once a brand becomes engaging it earns a place at the core of customers’ lives. Brands reach a nirvana: being considered as part of the ‘inner circle’ of trusted organizations which customers can lean on. Inner circle friends make you feel so good about yourself that you want to reciprocate, making them feel good about themselves too. How many brands really make you feel great? Of course, the Internet exposes us to hundreds – even thousands of brands. But let’s face it, we only have room for a finite number to welcome into our inner circle. It’s long been suggested that most people have between three and six “inner circle” friends. The challenge for brands is not just to attract– but engage with them by delivering appealing experiences that push the dial straight from “average” to “awesome”. Engagement can sound complicated but in fact it’s ingeniously simple. Offering simple relevant contact via multiple devices, across different channels. Planning personalization and content to be in context, rather than being an afterthought. Using technology for zero friction points during a customer journey. (One swipe and save time, money and headaches on everyday essentials). Fulfilling such standards, a brand becomes so engaging that customers clamour to be and feel part of it and its greater purpose. Once achieved, the brand works because it really gets personal needs, aspirations, concerns and goals. So, what simple steps can your brand take right now to engage intelligently and profitably? 1. In order to engage with people, involve your teams. To provide awesome external customer service, engage rather than just set targets with internal teams. The way you treat your employees reflects how you (and in practice, they) will treat others (your customers). Implement customer service training. Teach people to harness and develop technology, whilst also thinking beyond automated processes. The web is in people’s hands, pockets… on their wrists, in their bags… by their beds… at their sides. It is personal. To be engaging, customer experiences need to be human. Be brave – but remain smart. Use blogs, incorporate videos… include social media to show your brand is approachable. For example, Wendy’s gained positive feedback for its tongue-in-cheek uproarious roasts of burger competitors. Whether you are using Twitter to update events or Facebook to showcase products – by giving a face to the voice of your company you come across as engaging agile, useful and trusted. 4. Understand your customer – REALLY. Engaging brands bond with customers. They understand relationships, interests and so patterns of behaviour. Once you really get to know who your customers are and what they need, you can create a single valuable unified view to your brand which is irresistibly engaging. Winston Churchill famously said: “never, never, never give up.” His motto can often be spotted perched on desks of sales professionals. However, there is a fine line between ‘always on’ service and stalking people! One of the best approaches to tackling this is via omni-channel engagement, offering the right person (customer), the appropriate message, on the most useful channel at the right time. Through managing data and channels, you can learn when and how many times to engage. At a macro-level, before long, you’ll understand how some customer circumstances require more of (for example) a rich copy content mix, whilst in other circumstances, audiences look for less frequency but more video explanations and so on… In all examples, people need to feel brands genuinely engage and communicate. Left in responsible, astute hands digital and marketing become conduits for two-way engaging conversations which people welcome and look forward to becoming even further involved with. Customer listening is now essential Ever talked with someone who doesn’t seem to listen to you or let you get a word in edgewise? Pretty annoying, right? The same is true in digital marketing. In order for you to market …..
It’s easier to repurpose past clients than to find new ones Whether you’re an e-commerce shop, a small “brick and mortar” boutique, or a major retail chain, you should never overlook past customers and clients as a potential source of …..
Why do your customers do what they do? Ask them, not the data! How Coca-Cola could have foreseen the ‘New Coke’ crash It’s 1985. For the past 15 years, the Coca-Cola Company has seen market share decline for its flagship product. After conducting blind taste tests with more than 200,000 consumers, the soft drink …..